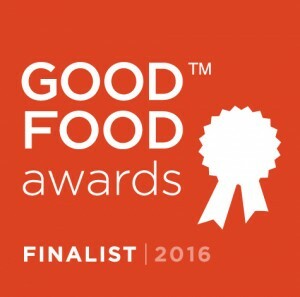 The San Francisco-based Good Food Awards announced the finalists on November 5, 2015. Both Marcia’s Little Hotties, the thinly sliced bread & butter pickles fermented with a habanero pepper, and Marcia’s Cherry Pops, pickled baby tomatoes are among other finalists in the Pickles category. Finalists were chosen from 1,937 entries in 13 categories. These food producers represent the best of America’s growing talent and socially responsible food crafters. Marcia’s Little Hotties are featured on the menu at Zingerman’s Deli. The new sandwich, # 216 Andy W.’s High Fryer, debuted as sandwich of month in May and reached record sales. It, along with Marcia’s company logo, was officially added to the menu in August. Michigan is represented at the 2016 Good Food Awards by seven food artisans that scored in multiple categories from pickles to preserves. Marcia’s Munchies, American Spoon, The Brinery, Swallowtail Farms, Jolly Pumpkin Artisan Ales Just Good Chocolate and Labrosee Farms are among the 263 finalists selected from across the United States. 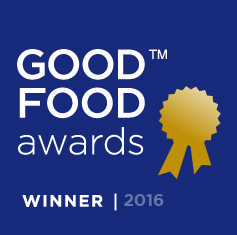 The Good Food Awards celebrate tasty, authentic, healthy and responsibly produced foods. The winners will be announced Friday, January 15, 2016, at a gala Awards Ceremony at Fort Mason Center for Arts & Culture in San Francisco, followed by two more days of celebration and trade events. Medals will be bestowed by renowned chef and activist Alice Waters and organics pioneer Nell Newman, tipping their hats to these exceptional food producers. Standards for the Good Food Awards include environmentally sound agricultural practices, good animal husbandry, transparency and responsible relationships throughout the supply chain. For a complete list of finalists, visit goodfoodawards.org.